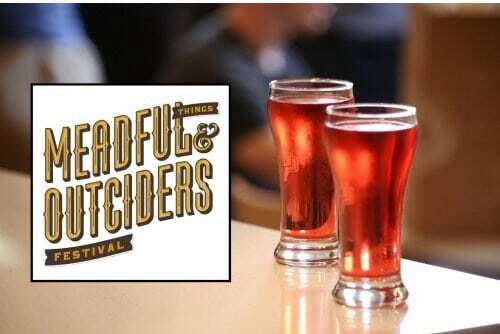 The 2nd Annual Meadful Things & Outcider Fest is coming back to Indianapolis on Saturday, September 2. This delicious event is Indiana’s only festival specializing in craft mead and hard cider. Meadful Things & Outcider Fest will take place at Circle City Industrial Complex Indianapolis, the home of the event’s organizers, New Day Craft. Since 2006, New Day Craft has been focusing on small-batch production of their innovative modern craft meads and hard ciders. “A lot of people don’t know how diverse mead and cider are and what better way to show someone than a festival!” says Michelle Aguirre, New Day Craft’s Tasting Room Manager and Event Coordinator. The list of cider and mead vendors is impressive—Michelle reports there will be close to 230 varieties on deck! Below is just a sample of who will be attending. The event will open to the public from 2–6 p.m. for VIPs and 3–6 p.m. for general admission. Guests will be able to have unlimited samplings and will also receive a commemorative glass. While sampling, enjoy entertainment provided by DJ Mike Graves, as well as a drag queen. For even more fun, there will be palm and tarot card readings, henna and a photobooth to help you capture some great memories. Be sure to bring your appetite to the festival, as well. La Margarita, Bee Coffee, Black Metal BBQ and Citizen Hash will be on hand to provide hungry guests some great food while they imbibe. All those good vibes got you feeling snuggly? You’ll be able to cuddle up with some kittens and puppies up for adoption through FACE! What could be better than drinking cider and having some four legged friends to play with? All attendees will need to be 21 to attend the event. Get your tickets now at Eventbrite!